"White Buds earrings, donated by Whiteleaf Jewellery. 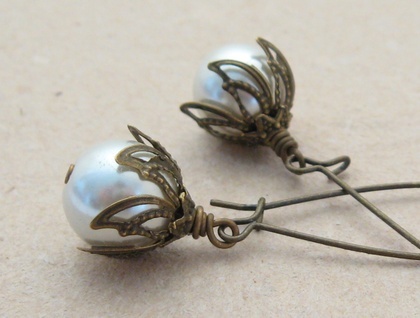 Large, off-white, glass pearls are topped with leafy, antiqued-bronze coloured bead caps. 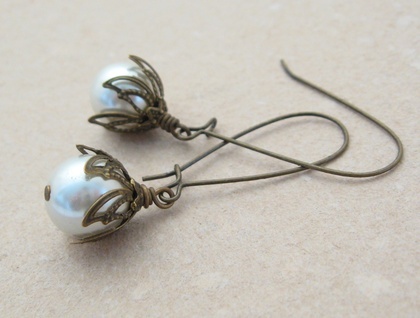 These delicate, bud shaped dangles are wire-wrapped, and dangle from elegantly arched ear-wires. 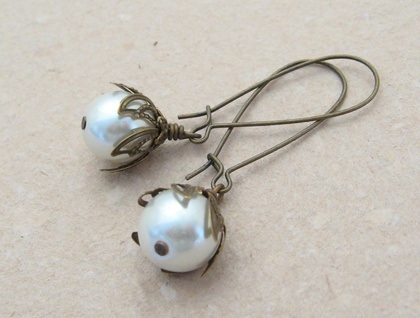 The faux pearls have small imperfections on them, which gives them a slightly aged, vintage feel. These earrings measure 50mm from top to bottom. 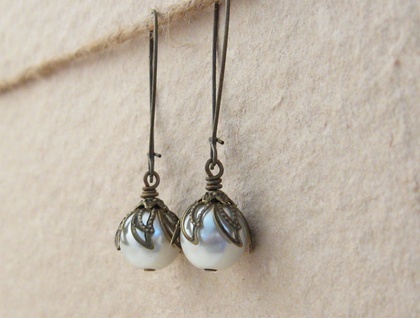 The little bud dangles are approximately 18mm long, including the wire-wrapping, and the imitation pearls are 12mm wide. The kidney-shaped ear wires are nickel free, so most sensitive ears should be fine wearing these. Whiteleaf Jewellery: earthy, eclectic adornments for nature lovers. "